And there are many different reasons. It’s important for us as Muslims anytime we go through any type of difficulty or pain to remember, not just these reasons, but that Allah is watching over you. Allah is planning for you better than you plan for yourself. He is more merciful to you than you can imagine. Protect the rights of Allah in your life and Allah will always protect you, whether you realize it or not. 1- The first of which the often time we go through hardship and our life goes through a detour in order for us to be purified of our sins due to our shortcomings. And the same way, you find gold in nature mixed with sediments and impurities, gold has to go through a rigorous, severe heating process. Once it comes out, it is purified from all the sediments and impurities, and it becomes one of the most valuable commodities in the world. Likewise, when you go through hardship, and you’re patient for the sake of Allah, Allah is using the opportunity and your patience as a purification from sins. 2- The second reason we struggle and go through hardships is to guide us back to Allah when we’ve forgotten about Him, when we go astray. It is a reminder, out of mercy from Allah to bring you back to Him. 3- The third is often times, people will become arrogant or prideful in their lives. So someone succeeds at work, school, or career… and they think “I’ve earned this”. This pride builds up and accumulate. To humble this arrogant person, Allah, out of mercy, will put something in their life so they’ll go back to Allah. Often times, the hardship that comes to you is merely a test to see whether you’re grateful to Allah or not. And this life is all a test. So when the test (pleasing such as wealth or difficult such as poverty) comes to you, Allah is testing you to increase you. 5- We go through hardships because this life is imperfect. When a difficulty comes your way, remember that if you’re looking for any kind of perfection, whether a perfect spouse, children, parents, job, health… you’re not going to find any of these things in this world. What you’re looking for is Paradise. So when a hardship comes your way, remember that the purpose of this world is a stepping stone to the perfection of Paradise. This life is not meant to be perfect for relaxation. So what you’re seeing is a fraction of your result. And often times, we look at the state of the Ummah and we have to realize that there is a strong correlation between how far we are from Allah and the state of our well being. If you don’t go through any type of pain, you’re not going to grow. You’re not going to have that new found strength. So when you go through a difficulty and you’re patient, Allah is increasing you in your strength as a believer. 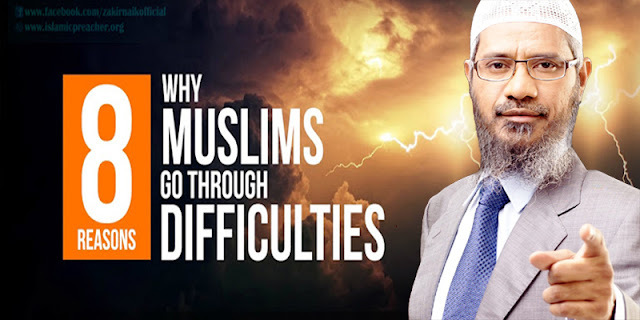 8- Difficulties and hardships strike us at random times, decreed by Allah, because Allah will often times close a door for you, or cause you to go through something so that you can find a better door. Often times, people will say they’ve been through a certain business, or marriage… and they pray istikharah. And what happens afterwards when it fails, is they’ll be tested, whether they realize or not, that Allah gave them this experience for a reason, and that had they not gone through this experience, they would not achieve that which is better. So when something is taken away from you, remember that Allah is planning something better for you. Because Allah is always there for you.